Can’t believe it’s Friday again/finally! Time flies. Just one more week until SPRING BREAK! I am escaping to one of my favourite places in the world: Milano (the capital of CHICISTAN). What are your plans? This picture of Garance’s new heels reminds me of Milan so much! Probably because camouflage prints and Prada heels are essential components of the Milanese signature style;-). 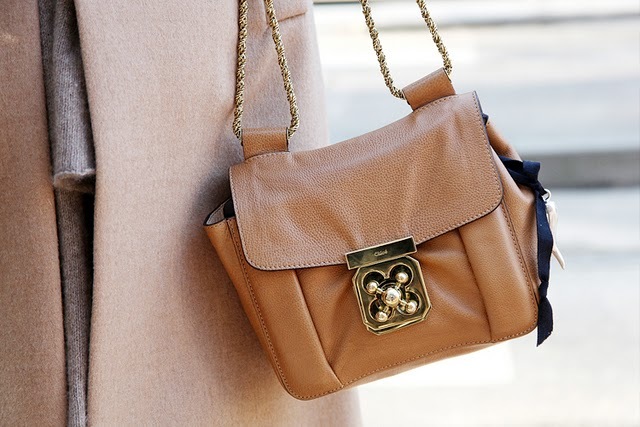 This mini version of the Chloé Elsie bag belongs to Aura Sansone, fashion editor at Vogue Nippon and honorary citizen of Chicistan. Love the double-denim look! So easy. Another element of the Milanese style kit: a Fendi logo bag. Aura again. Captured by the Sartorialist in the streets of Milan.